Restaurant in the heart of Newbury wants to be instrumental in changing perceptions of the subcontinent’s cuisine. We are a company deeply committed to setting standards in excellence and quality, its innovative yet traditional cuisine and impeccable service delivers just that! Chilis provide a classic combination of indisputable knowledge, unique experience and traditional values that carry worldwide recognition. The restaurant offers a sophisticated fine dining experience with effortlessly charming staff, discrete service and tantalising food that few can compete with. That is the combination to ensure guests to visit us again. The inspiration behind Chilis is a team of professionals who attributes their success to its traditional Indian style of service. Their mantra is an old Indian custom – “Athithi devo bhava” which literally translated means,“the guest is god”. 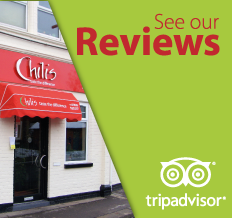 The Chilis team is renowned for making guests feel extraordinarily special and welcome – as well as for their depth of knowledge about Indian cuisine. We are dedicated not simply to meeting expectations but to exceeding them. 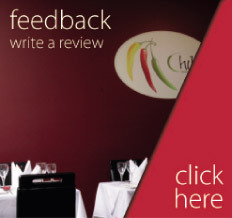 And our enthusiasm, style and panache make each dining experience a truly memorable one. 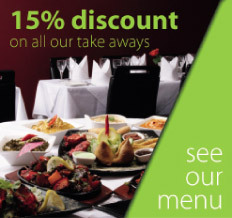 Our aim is to visualise the ultimate dining experience through the eyes of a guest and offer authentic Indian cuisine with royal service in a traditional yet relaxed atmosphere.